"Outstanding," Richard Osterlind. "Awesome," Lee Earle. "The best set of Marked ESP cards I have ever seen," Nicholas Einhorn. These are just a few of the comments we received upon the launch of the Beyond ESP deck, an aesthetic leap forward to the tried and tested ESP packs. First and foremost - this is the most innocent looking deck of ESP cards you will ever own. The plain black backs make the cards look like little else than research tools, yet they contain an incredibly subtle marking system that allows you to identify each card with a short glance. Housed inside the "International Paranormal Research Association" box are two complete ESP or Zener decks. One red backed deck, and one original black backed deck. The new cards have been printed to the highest standard by the US Playing Card Company, so they look and feel great. Inside your deck you'll also find a selection of extra cards and fakes providing you with more creative possibilities than any other ESP deck on the market. 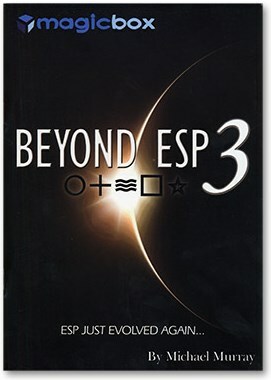 For those who might be short of ideas, Beyond ESP 2 comes compete with a 32-page booklet containing 8 solid routines from a collection of mentalism's top authors including Lee Earle, Banachek, and Richard Osterlind. The result is a startling collection of ESP routines and ideas, which can often be difficult to track down, all between the covers of one booklet. Coupled with the ground-breaking Beyond ESP cards this is guaranteed to be one purchase that will amount to far more than the sum of its parts!